Over the course of this election, Republican presidential nominee Donald Trump has not been shy about his xenophobic plans to build a wall between the US and Mexico and ban Muslims from entering the country. 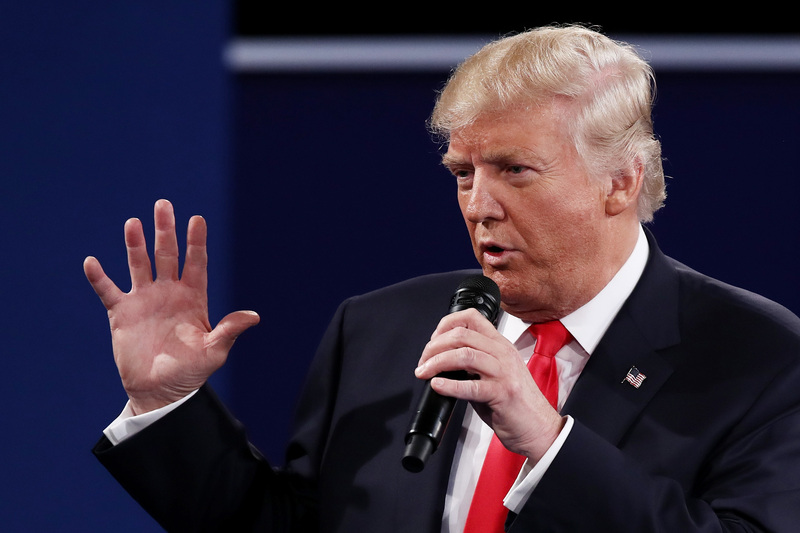 During the second presidential debate on Oct. 9, a Muslim constituent posed a question to both presidential nominees regarding her concern about how Trump's plans would impact Muslims, to which he responded that his plan was called "extreme vetting". His explanation of this plan is perfectly summed up in this viral tweet about Donald Trump's Islamophobia, which has generated thousands of views over the course of the second presidential debate. "There are 3.3 million Muslims in the United States and I'm one of them," said the constituent. "You've mentioned working with Muslim nations, but with Islamophobia on the rise, how will you help people like me deal with the consequences of being a threat to the country after the election is over?" In Trump's explanation of his stance, he told the constituent who posed the question that it was her responsibility, along with other Muslims, to report any kind of bad or suspicious activity that they saw: "You're right about Islamophobia and that's a shame," said Trump. "One thing we have to do is we have to make sure that because there is a problem, whether we like it or not — and we could be very politically correct, but whether we like it or not, there is a problem and we have to be sure that Muslims come in and report when they see something going on. When they see hatred going on, they have to report it." In a tongue-and-cheek response to Trump's deflection of the question, author and Brooklyn College, CUNY professor Moustafa Bayoumi tweeted, "I'm a Muslim, and I would like to report a crazy man threatening a woman on a stage in Missouri." Of course, Trump's attempt to hide is Islamophobia was laughable with or without Bayoumi's commentary — the phrase "You're right about Islamophobia and that's a shame" is certainly ironic, given that it is Trump's frequent Islamophobic comments, including the ones he made immediately after saying this, are a huge contribution to the anti-Muslim sentiments in this country. And, as a lot of people on Twitter are pointing out, nowhere in Trump's answer during the debate did he actually address the ban he had proposed. Although Trump dodged the voter's question, the main (and terrifying) takeaway is still clear: Donald Trump's Islamophobic views aren't going to change anytime soon.